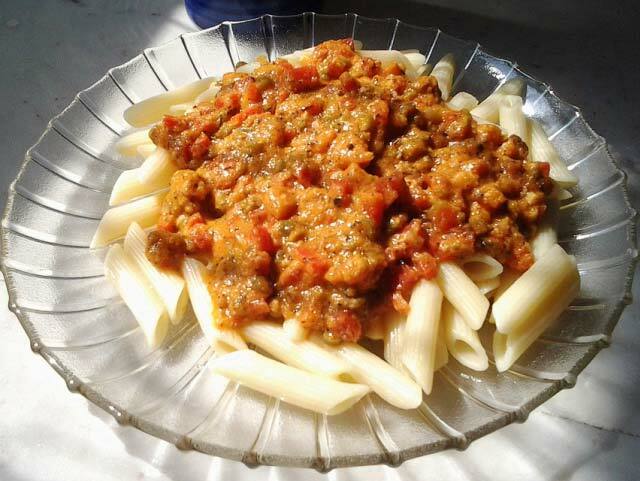 A quick and easy recipe for Penne with Arrabbiata Sauce. I love pasta, be it in any form! Right from fettuccini, linguini, spaghetti, anything in the name of pasta appeals to me. However, more than the white sauce, it’s the tomato based gravy that I like. The mildly spiced pasta, along with the tanginess of the tomatoes, just makes a perfect lazy afternoon lunch. With my husband away, I took some leisure time out from my writing schedule, to make this delicious recipe. 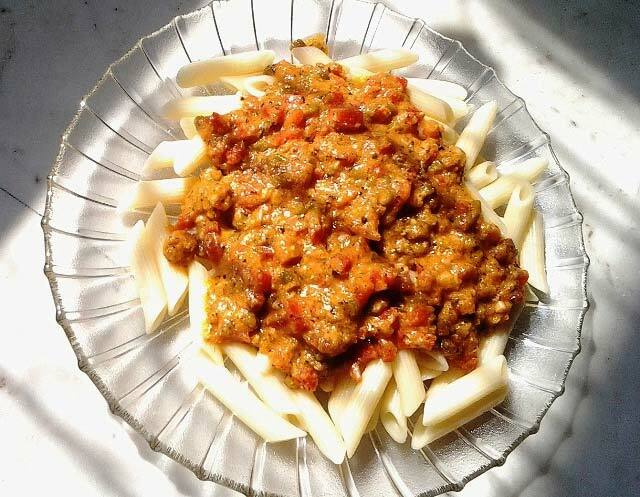 Let me share my personal pasta arrabbiata recipe with you. It’s quick, simple and good to eat! It’s amazing how some simple ingredients could be transformed into something so heavenly. Follow the recipe steps and you will know exactly what I mean. Take the specified amount of extra virgin olive oil into a pan and immediately add the finely chopped garlic. Do not brown it much and add the finely chopped vegetables. I used carrots and beans, but you can add any other vegetable of your choice. Stir fry on a very high flame for about 2-3 minutes and then add the freshly made tomato puree. Simmer the tomato mixture, for about another 5-10 minutes, or until cooked. Now add the dried herbs, as mentioned. Although I tried dried herbs, I would strongly recommend fresh herbs for making pasta, especially if you have easy access to them. Nothing beats the fresh smell of basil and thyme. They are very aromatic and lend the pasta their special touch. Anyway, since I couldn’t find it in the stores nearby, I resorted to the dried version of the herbs. They weren’t bad either and made my day. Finally, add the salt and pepper and smooth in the sauce till thick and creamy. Place pasta, which has already been boiled, onto a plate and pour a generous serving of the tomato sauce over it. The finale looks gorgeous! Trust me, it’s equally delicious and super easy to make! hi! this is indeed a very nice recipe, but there is a slight variation. A classic arrabbiata sauce does not contain fresh cream, at all.And onion is another major component in the sauce, soft cooked onions add a wonderful sweetness and texture to the sauce. also arrabbiata means angry, so it should contain red chilli flakes or paprika. that is how you differentiate arrabbiata from a pomodoro or nepolitana sauce. For a very authentic taste, i guess you should skip the beans and add in celery. but since it is difficult to find celery in india (if you stay in india that is) it is okay to skip that as well. a pasta sauce turns out much better when finely chopped tomatoes and a little bit of tomato puree or paste is used, instead of grinding all the tomatoes- found out by trial and error and ‘n’ number of pasta disasters. Thanks Aparna for all those fine pointers! I guess I’ll have a lot to learn from the food connoisseurs like you! 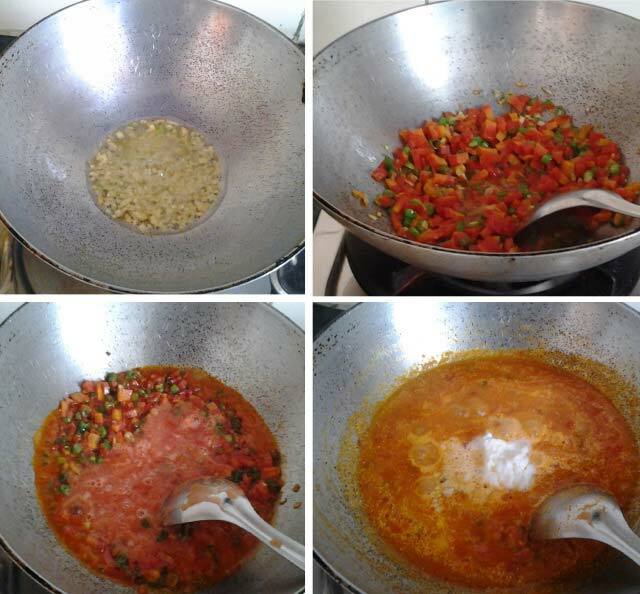 I was waiting for your reply Malvika, and yes i am waiting to learn a lot from Arparna too :P..
hi malavika, it is a very nice personalized version of this sauce, as anu mentioned, full credit to that, very few people like to comfortably craft their recipes to their taste! which is actually brilliant. Ps- Something i’ve always felt ‘Cooking to me is about love, its my expression of love not just for food but for people I feed (myself included)’ :)…. So any cuisine that’s cooked with love is a treat to the palate.. Sorry for interruption in between. 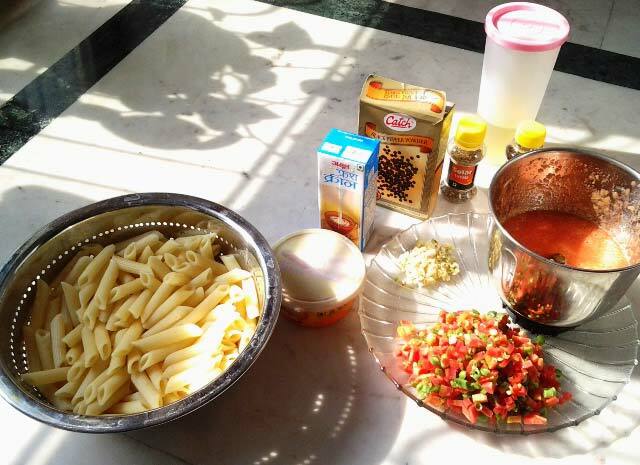 I am really love Arrabiata Pasta and because this recipe is simple and made in Indian style, a new cook like me can also make it. So i say thank you for sharing it. Welcome Neha! Thanks for liking the recipe. Anu, you have rightly put, cooking is indeed a pleasure. To me it’s therapeutic as well!